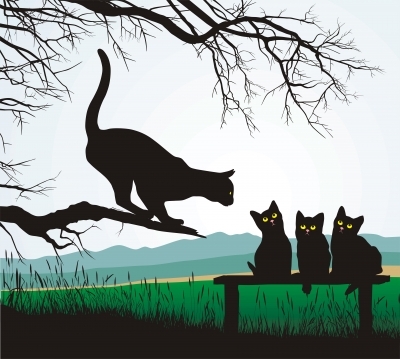 The reality is that although cats usually land on their feet, this isn’t always the case, and even when they do right themselves, they often sustain serious injuries. Cats use their excellent sense of balance to orient themselves in space and adjust their body positioning during a fall to increase the likelihood of landing right side up. Because cats have highly mobile backbones and floating collar bones (not attached to the shoulder joints), they are able to bend their bodies in ways that humans can’t. As cats fall, they twist their bodies until an upright position is established. Cats also spread their legs in a sort of flying squirrel pose, which is believed to create a parachute effect that slows falling and also serves to spread the point of impact over a larger area upon landing. Kittens begin to develop the righting reflex at 3 to 4 weeks of age, and it is fully developed at about 7 weeks. In 1987, veterinarians at Manhattan’s Animal Medical Center conducted a study of cats that had fallen from high-rise buildings. They found that 90% of falling cats survived, though the majority suffered serious injuries. More than one-third required life-saving treatments, while just under one-third did not require treatment at all. Strangely enough, the 1987 study found that death was less likely when cats fell from heights of 7 to 32 stories than 2 to 6. Some have theorized that greater survival rates may occur with longer falls because when falling shorter distances, cats have less time to adopt the flying squirrel pose. Another study of high-rise syndrome conducted by Vnuk et al. (2004) found that the majority of falling cats were less than a year old, and while most (96.5%) survived, many suffered serious injuries such as broken limbs and thoracic damage. The worst injuries occurred with falls from 7 stories or more. These studies, while interesting, suffer from a significant limitation in that their data comes only from cats that were actually brought into clinics for veterinary care. It is unknown how many cats die on impact. Cats may jump out a window in an attempt to catch a flying bird or insect, and kittens are particularly likely to behave impulsively. Cats may also fall out of a window when asleep due to dream-related movements. In addition, if something scary happens in the home or the cat is being chased by another pet or a child, she may jump out the window in a panic. On a lighter note, the cat’s purported ability to land feet first along with the tendency of toast to land butter side down has caused some to speculate that if one were to attach a piece of buttered toast to a cat’s back, the falling cat would spin indefinitely, thus creating a sort of antigravity device. Elkes, J. (9 June 2001). “The Secret of Antigravity.” Forums.anandtech.com. Schultz, J.L., ASPCA Companion Animal Programs Advisor. (2009). “Feline High-Rise Syndrome.” ASPCA.org. Vnuk, D.; Pirkic, B.; Maticic, D.; Radisic, B.; Stejskal, M.; Babic, T.; Kreszinger, M.; & Lemo. N. (2004). “Feline High-Rise Syndrome: 119 Cases (1998-2001).” Journal of Feline Medical Surgery, 6(5): 305-312. Whitney, W.O., & Mehlhaff, C.J. (1988). “High-Rise Syndrome in Cats.” Journal of the American Veterinary Medical Association, 192(4): 542.